MotorSports Racing style, non-retainable studs can be completely removed from the panel when unlocked, which can be advantageous with sliding or curved panels. 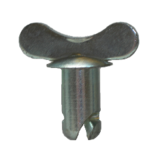 The wing heads allow the fastener to be hand operated without the need for a tool. These do not have a groove under the head for a retainer so, grommets are not necessary for installation. Steel studs are zinc plated with clear chromate to prevent corrosion. They are silver in color and RoHS compliant. Additional sizes, materials and finishes are available upon request (minimums may apply). If you have any questions or need technical assistance, please Contact Us for details, we will be glad to help.